Chicken fajitas are a healthy and easy recipe to master. The red pepper flakes add heat to the recipe, so you can adjust the amount used accordingly to your taste. 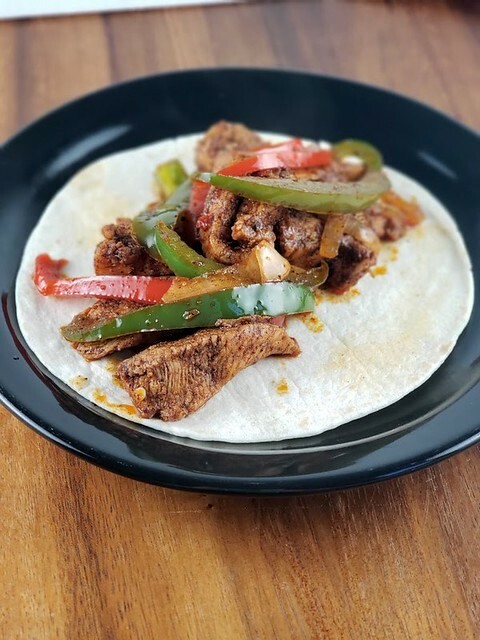 These chicken fajitas have great flavor added by the peppers and onion in combination with the seasoning mix. Some prefer to make the entrée even healthier by not using tortillas and placing the cooked ingredients into a bowl instead. Either way, these are delicious. From Cully’s Kitchen to yours! Mix together salt, pepper, chili powder, paprika, garlic powder, dried oregano, and red pepper flakes in a small bowl. Put sliced peppers and onions into a large mixing bowl and cover with half of the seasoning mix, applying as evenly as you can. Slice chicken breasts into thin strips and place into a separate mixing bowl. Add the remaining seasoning mix and apply evenly to the raw chicken strips. Put 1 tbs of oil into either a wok or a deep skillet. Heat on medium-high heat for about 2 minutes. 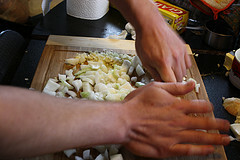 Add the peppers and onions to the pan and cook, stirring frequently until they are tender (approximately 5 minutes). Remove from the pan and place back into large mixing bowl. Add the remaining 1 tbs of oil to the pan and add the sliced chicken. Stir-fry the chicken until fully cooked, for about 5 minutes. Add the cooked vegetables back to the pan and continue cooking for another 2 minutes, stirring often. Serve on fajita tortillas or in a bowl.